Gloria Kasler, Nightingale’s CEO, is proud to sit on the board of The Reggie Sanders Foundation to help do our part in raising awareness for Autism. The Reggie Sanders Foundation is a non-profit organization that aims to provide a comprehensive network of support for children and families living with Autism Spectrum Disorders. Their vision is to ensure that all families living with Autism Spectrum Disorders have access to high-quality early intervention and support. Over the past three years, they’ve helped countless families in South Carolina and beyond. The foundation has raised thousands of dollars in an effort to better provide empowerment to people in challenging circumstances. With their Dream Within You Campaign they have fulfilled 183 dreams to date and counting. At the Advantage Games the stars are the kids and their families. With the pillars of the Reggie Sanders Foundation Tool Kit Survival, Success, Significance and Service this game bring this wonderful and diverse group of individuals into the spotlight where they are empowered and encouraged to showcase their skills. This is done without judgement or force with the goal being to change not only the way they are viewed and treated, but also gather them in from the margins of society. We don’t just level the playing fields we make; new ones by leveraging the gap between communities and industries. 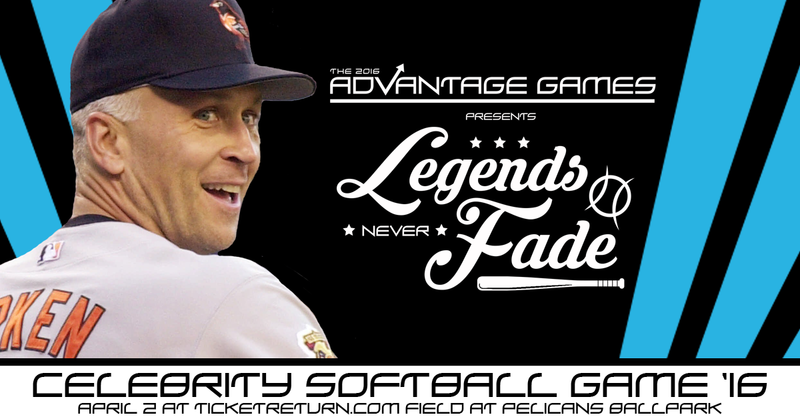 The “Iron Man” himself, Cal Ripken will join the Legends Never Fade Celebrity Softball Game at TicketReturn.Com Field on Saturday, April 2nd. Ripken will join Hall of Fame Legendary Coaches Tony La Russa, Bobby Knight and CCU’s finest Head Football Coach Joe Moglia to raise funds for autism and support the Reggie Sanders Foundation, Inc.